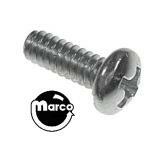 Machine screw with 6-32 thread and 3/8 inch long with phillips pan head. 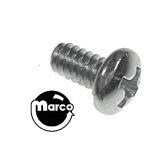 Machine Screw 6-32 x 3/8 inch long phillips with round washer head. Machine Screw 6-32 x 2-1/2" long phillips with round washer head. Unslotted 1/4 inch hex head machine screw 6-32 thread x 1/4 inch long.